Downpatrick Head - Downpatrick Head. A signature point on the 'Wild Atlantic Way' tourist route. Dun Briste at Downpatrick Head. Standing proud and alone, this magnificent sea stack is the crown of Downpatrick Head, Ballycastle, Co Mayo. 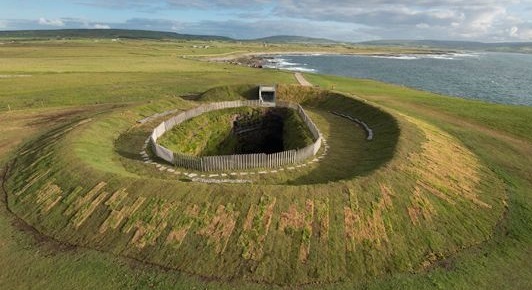 This stunning location in North Mayo is where millions of years of geological formation meets folklore, legends, history both ancient and modern, including World War II and the birth of Christianity in Ireland. Now a signature point on the "Wild Atlantic Way", time spent here can vary from tranquil on a calm day to ferocious wind and waves on a stormy day and a myriad of experiences in between. This RTE Radio "Documentary On One" broadcast describes in great detail the first helicopter trip to the stack made by locals including Dr Seamus Caulfield in 1981.